R.A. Dickey's unlikely emergence as a dominant National League pitcher is one of the feel-good stories of the 2012 season. Not many athletes hit their stride until their mid-30s but that's exactly what the knuckleball specialist has done. And while R.A. Dickey cards have likely peaked in value, his story and continued success should still keep most of them out of the commons bins. 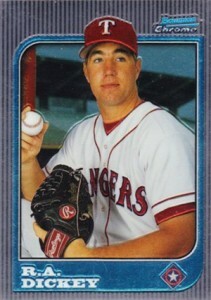 Drafted by the Texas Rangers in 1996, Dickey spent the early part of his career as a reliever. Really, it is a wonder that his career lasted as long as it did as his stats don't show a strong pitcher. After bouncing through Texas, Seattle and Minnesota, Dickey found himself with the Mets in 2010 where he became a full-time starter. After a solid couple of years, Dickey established himself as one of the game's best in 2012. While he has been great all year, his back-to-back one-hitters in June elevated him from cult hero to baseball superstar. As great a story as the pitcher is, collectors have to be wondering when the clock is going to strike midnight. Thankfully, with a knuckleball as his dominant pitch, it is possible that Dickey could be pitching well into his 40s. Those looking to collect R.A. Dickey cards have just two rookie cards to track down: 1997 Bowman Baseball and 1997 Bowman Chrome Baseball. For years, both cards could have been found for pennies. From a percentage standpoint, they've soared in 2012. Collectors can now expect to pay $10 and up for the 1997 Bowman Chrome R.A. Dickey rookie. Don't expect much more growth over the long-term. It's simply too late for Dickey to become an all-time great. However, that won't stop him from being a fan favorite for years to come, which will help keep his rookies from going back to the common box tombs they spent so many years in. Those wanting autographed R.A. Dickey cards had just one set to look to for a long time, the 2004 Upper Deck USA Baseball 25th Anniversary box set. The card has three different ink versions: Black #/180, Blue #/60 and Red #/10. Topps included autographs and memorabilia cards in late-2012 and 2013 products. At this point, there isn't a lot of R.A. Dickey autographed memorabilia available. 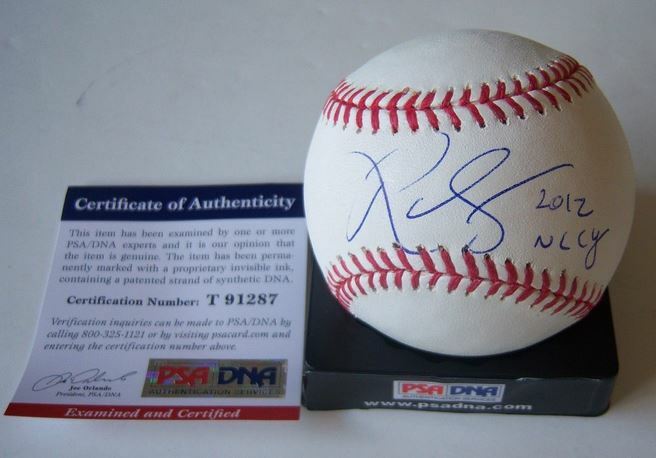 The safest bet, at this point, are baseballs authenticated by Steiner Sports. Looking a lot younger, it's a little ironic that the knuckleball hurler is shown gripping a fastball. 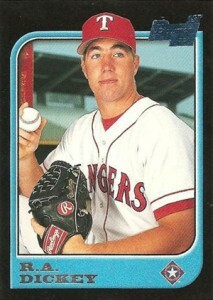 Dickey is the latest (and likely last) rookie to emerge from the deep 1997 Bowman Baseball checklist. Besides tons of solid rookie cards, the set is also notable for debuting the black borders that were a staple with the brand for many years. Collectors can also look for the 1997 Bowman International parallel. The foil cards don't carry much of a premium, but they're also not terribly difficult to come by. The more desirable of the two first-year R.A. Dickey cards, 1997 Bowman Chrome Baseball is almost identical to his regular Bowman rookie. The major difference is that the card is done on chromium card stock. 1997 Bowman Chrome Baseball is a genuine modern classic in the hobby. Parallels include International, Refractors and International Refractors. Below you will find an example of what R.A. Dickey's authentic signature looks like. This can be used as a first point of reference for determining the legitimacy of autograph memorabilia, but is not a substitute for having your items authenticated by a well-respected professional autograph authentication company. Some of the trusted sources within the sports memorabilia market include the following companies: PSA, JSA, and Mounted Memories. The letters "R-a" are clearly legible. The letter "R" is written with two lines that includes a lifting of the pen, the first is the down stroke that leans to the right, the second line starts to the outside near the middle of the first line and is used to draw the curve of the letter and circles back to draw the right down stroke. The letter "a" is lower case and open on the top right. A "." follows and then a large circle implies the letter "D."
The last character resembles a capital letter "S" that slightly passes through the "D."
A haphazard dot implies the letter 'i." Authentic examples of R.A. Dickey autographed jerseys and photographs are in short supply. Extreme caution should be used when shopping for such items. 8>O WHAT…is his claim to fame ?? 2012 Panini Prizm R.A. DICKEY Auto Base Card Toronto Blue Jays P! !